You might describe inflammation as a reaction in the body that causes redness, swelling, pain, stiffness, fever, or that the area is warm to the touch. You know, like when you sprain your ankle and within minutes it’s the size of a grapefruit. That’s pretty obvious inflammation. But what about the silent hidden inflammation that’s inside your body, the stuff no one sees or feels or talks about? The inflammation that makes you bloated even when you haven’t eaten anything unusual, the inflammation in your lungs that makes you short of breath, the inflammation in your kidneys that causes high blood pressure. What about that? And why isn’t it being addressed? I’d like to offer a different way of looking at inflammation, as well as a different approach in healing it. Way back when I was first in practice, I was privileged to study a branch of health care called Homotoxicology. This model was developed by Hans Weckeweg, MD who created a 6-Phase Chart to show the progression, and hopefully resolution, of disease. 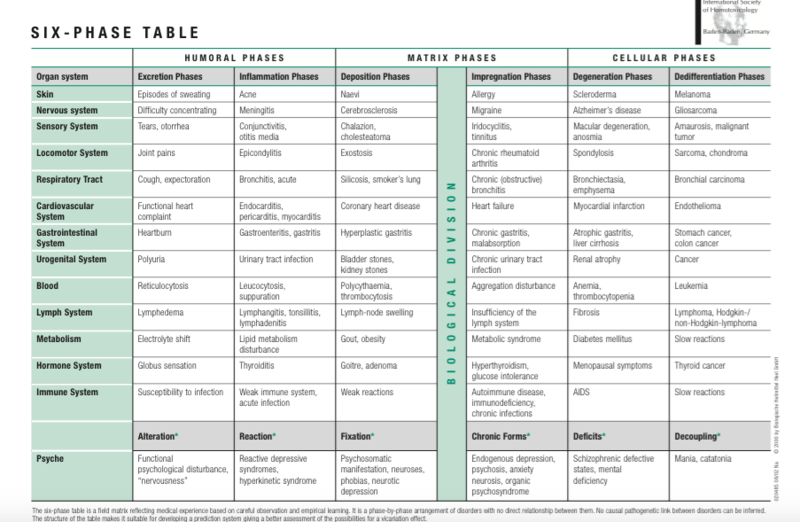 Along the left side of the chart are all the systems of the body: skin, digestion, respiratory, urinary, etc. Along the top are 6 distinct phases of disease as they progress from mild and acute on the left to severe and chronic as they move to the right. In between are examples of common conditions that correspond to the progression of the 6 Phases of Homotoxicology. To break it down simply, here’s the concept: As a toxin (this can be a bacteria, virus, chemical exposure, allergen, anything that becomes a trigger) enters the body, the body recognizes it as something that shouldn’t be there. The normal healthy reaction is for the body to attempt to excrete it (Excretion Phase). This would manifest as sneezing, coughing, urination, diarrhea, sweating, etc. That’s why when you catch a cold, you sneeze and have a runny nose. The bug itself isn’t making you sneeze, your body’s innate intelligence is attempting to get rid of the virus through your nasal passage. Now, when the body’s attempt at elimination fails, the body’s normal healthy reaction is to then recruit inflammation (Inflammation Phase). Yes, that is correct. Inflammation is a normal healthy reaction. It’s how the body gets rid of things. But what do we do? We panic. We think, “This must be bad.” We go to the medicine cabinet and take an anti-histamine, an anti-diarrheal, an anti-inflammatory. Each of these is an attempt to block your body’s very natural normal healthy response to getting rid of whatever has invaded it. Congratulations! You feel better AND you’ve just driven that toxic invader deeper into your body. You’ve now dried up the mucus in the sinuses that is supposed to be there washing away the virus, resulting in an extended duration of your cold. You’ve artificially stopped your diarrhea, but by keeping that bug right there inside your intestines, so it can multiply even more and affect you even longer. The anti-inflammatory that you took for your sprained ankle did a great job of reducing the swelling, but now you’ve also reduced blood flow to the area so there’s no way for the body to eliminate the damaged cellular debris. Oh, and since the swelling is back down, you’re more prone to re-injure it because the body’s natural splinting mechanism has been taken away. So now that you’ve driven these toxins deeper into your cells, tissues, organs and systems, whether by medication use or through toxic overload, what happens next? Well, when the body can no longer contain the toxins, it attempts to package them up (Deposition Phase) by creating things like cysts, tumors, gall stones, fat, goiters, things like that. And when that fails, the toxins continue to move deeper, causing allergies and autoimmune diseases (Impregnation Phase), chronic degenerative conditions (Degeneration Phase), and cancers (Differentiation Phase) as the internal state of the body progresses farther toward the right side of the chart. Though the inflammatory process itself is initially a normal healthy reaction, when inflammation gets out of control, or gets driven deeper into the system, it becomes the root cause of much disease in the body. Now, the good news is that it is possible to vicariate these toxins back out, thus moving the state of the body from chronic degenerative phases on the right side of the chart back to acute inflammatory and excretion phases on the left side of the chart. This is essentially called detoxification. Through gently cleansing the body and flooding it with the necessary nutrition to pull the inflammation and toxins out of the deeper lying tissue, it is possible for your internal state to move from chronic conditions to excretion as the toxins are eliminated from the body. 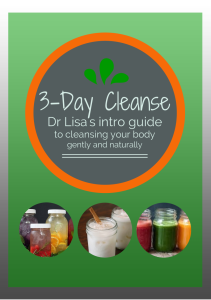 For more information about how you can begin this cleansing process, see Dr Lisa’s 10-Day Inflammation Cleanse in The Health Dimension’s Shop.